We embed the resulting business or operating model innovation into our clients’ core operations. We also help companies establish new ventures where separation from the core is needed. The outcome is delivered in a way the business can absorb, that sticks and scales. We call this Intractable Problem Solving and it’s our purpose. Digital Problem Solving (DPS) is a new practice within the global consultancy Arthur D. Little. Founded as a greenfield three years ago, DPS is a team of 50 problem solvers, based out of London and New York. We are issue-centric, solution-agnostic and multi-sector. This means we are obsessed with solving the problem or seizing the opportunity. Two key approaches inform all our work: Next over Best and Open Consulting. Central to our philosophy is the belief that breakthrough solutions are crafted using Next Practices, as opposed to Best Practices. By biasing all activity to the “next”, or what might work better now, we avoid the trap of incrementing today’s “best practices”, or being trapped by the Innovator’s Dilemma. Our Open Consulting model brings together a partner network of wide-ranging expertise and resources into single, seamless teams to take on the challenges. DPS’s Open Consulting network gives us access to deep specialists, including industry-specific subject matter experts, alongside a rich and varied pool of design and software engineering talent. This model also means we are not motivated to (or subconsciously convince ourselves to) sell yesterday’s solution, or an existing capability set that we have on our “bench”. Through the model, our clients gain access to top-drawer, FANG1-style engineering talent of a quality they often struggle to find or hire themselves. 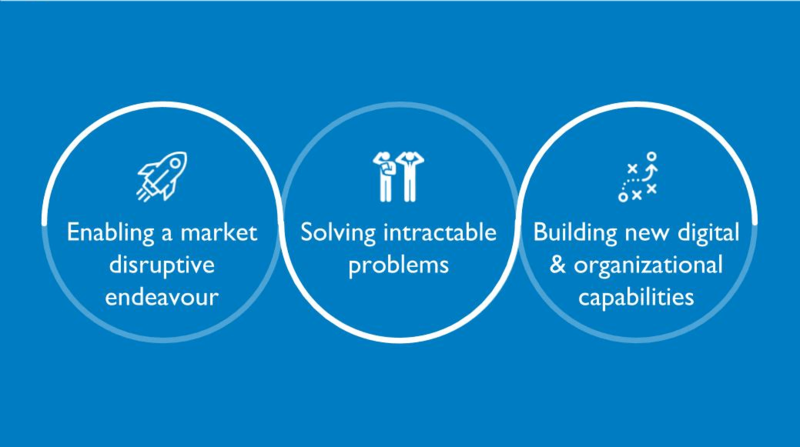 These approaches ensure the digital solutions and business model changes we deliver, as one-team with our clients, always fit the problem. 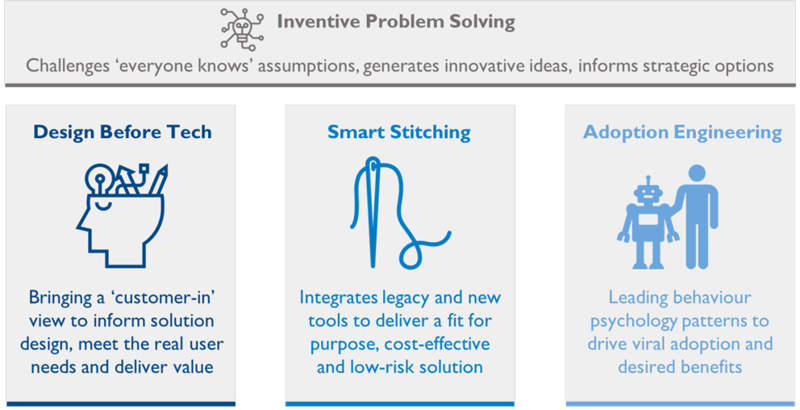 They also help us avoid a number of common strategic bear-traps, such as bending the problem to fit pre-packaged or pre-determined solutions (business, operating model and digital), or reverting to the status quo. 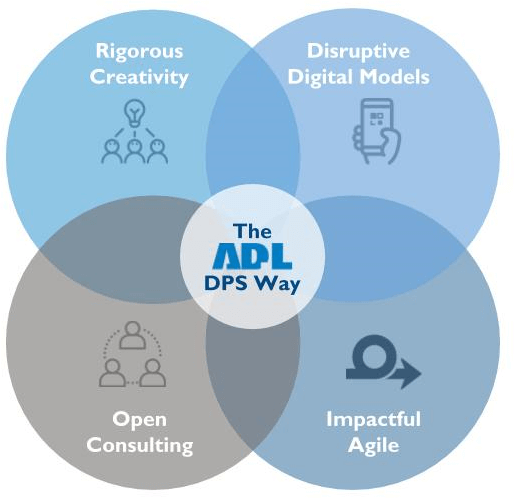 The ADL DPS team stands in front of all the activities and capabilities required to deliver a breakthrough business solution. From initial strategy and concept, to delivering the digitally-enabled business transformation or new venture, we work side-by-side with our client to establish new capabilities and sustain and evolve their new business or operating model. Clients feedback that our differentiator stands in the combination of the above capabilities: a multi-sector team, a Next over Best philosophy and Open Consulting. Phase 0: Core to our approach is ensuring that we are addressing the right client problem and have clarity over the right way forward. We often find that our stakeholders have differing views on the problem and the desired outcomes. This process drives a clarity and consensus that often our clients believed was not possible. Phase 1: Where we seek to build a working slice of the final solution. We will create a detailed set of hypotheses and assumptions that will drive the success of the solution and set about proving or disproving those at pace through a set of validation exercises. Rapidly determining the right final solution for our clients and beginning to understand the factors that will drive viral adoption and ultimately the benefits needed. 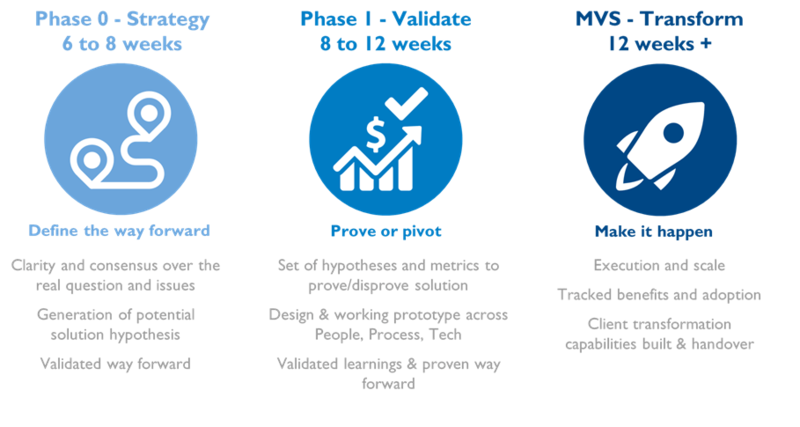 Minimum Viable Solution: Having proven the solution and the ability to drive the desired outcomes we complete the journey through a process of scaling out and enrichment, whilst always monitoring that the broader adoption and benefits are being realised as was envisaged. Clients who work with DPS enjoy a near unprecedented 90% success rate with our programs. We are always open to discuss the 10% that fail and the associated learnings, although they are rarely a total failure in terms of business impact. We find a transformation initiative may fail when the input question is not framed correctly, something that always inhibits real innovation, or where changes in senior clients’ focus have emerged. This is perfectly understandable given market dynamics and impact on focus for senior decision makers. Working one-team with our clients, we have delivered initiatives including transforming the client business model from pay per device to data monetization, resulting in a step change in company valuation; marketing transformation to enable real-time customer engagement, resulting in increased customer revenue; and omnichannel retail transformation, resulting in a major shift in enterprise value. Bold, talented and empowered people, working as one-team across the client and DPS, deliver breakthrough results. Methods do not. However, while the scale of endeavor and specialists involved varies significantly, there is a consistent pattern of creating a bubble of innovation and then making it stick. We love working with like-minded people to address their biggest, most complex and most critical challenges. Arthur D. Little’s motto (ADL’s founder and MIT chemist) was “Who says it can’t be done?”. The culture of our team is always aligned to delivering on this 100-year-old promise.